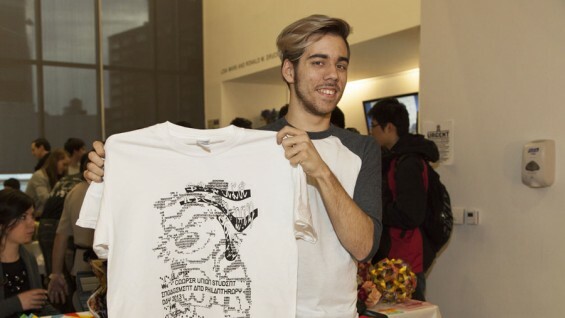 On the evening of Thursday, February 28, a crowd of students from all three schools gathered at Frankie’s Kitchen on the third floor of 41 Cooper Square. They were there to celebrate the end of Student Engagement and Philanthropy Week, a three-day drive by the Student Philanthropy Committee to raise money for the school and push toward their increased student participation in class giving. 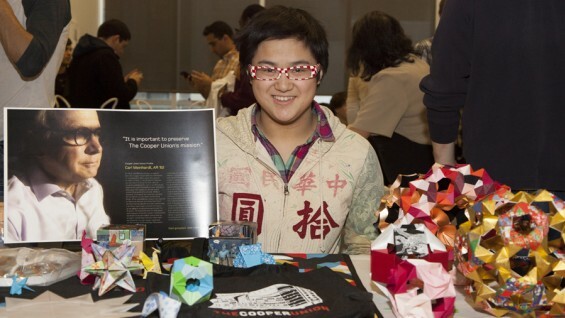 There was cake and sandwiches and Cooper swag giveaways—but even more importantly, a spirit of giving back that’s very native to the Cooper Union community. When news of financial problems at Cooper surfaced last summer, some students responded immediately. A group from all three schools approached Joseph McDonald, the director of the Annual Fund, about what they could do to help. While a tradition of senior class giving already existed at Cooper, McDonald and the students realized there was no structure in place to encourage underclassmen to participate in supporting the school. The group formed a Student Philanthropy Committee and began to think about how they could expand this network and instill values of giving back among all students. Members of the Student Philanthropy Committee set up tables around campus for the past three days to recruit student donors. They haven’t reached their 100% goal yet, but have made significant strides—doubling senior donor participation and greatly increasing underclassman participation as well. Cooper’s precocious origami club also got involved, holding an online auction of original works in paper to raise proceeds for the school. That auction is ongoing through midnight on Friday, and the works have already reached several hundred dollars.